Making a traditional carrot cake egg-free and dairy-free is relatively straightforward. 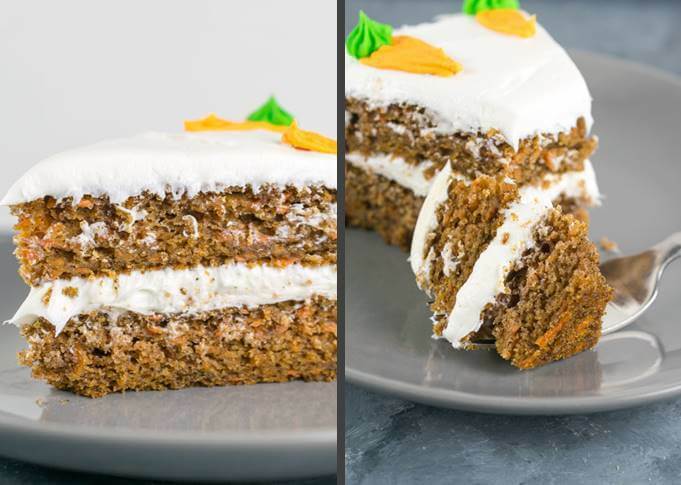 Unlike with eggless vegan white cake, where replacing the structure from eggs is important, carrot cakes are more forgiving. Simply removing the eggs and adding some extra leavening does the trick. At times, vegan is conflated with healthy and you might find recipes made with whole wheat flour or spelt to add nutrition. I love making healthier treats at times, as seen in my marbled vegan chocolate banana bread, but when it comes to something as classic and timeless as carrot cake, I wanted to maximize on texture and flavor. Sourcing cake flour isn’t easy for everyone so I’ve used all-purpose wheat flour for this vegan carrot cake. Rounding out the ingredients list are vegetable oil (which negates the need for any margarine or butter substitute); carrots; applesauce (for adding moisture and binding); both white and brown sugar (for flavor purposes); baking soda and powder; spices (cinnamon, nutmeg, allspice); vanilla; and non-dairy milk. See? Nothing weird! Finally, I like to spike my vegan carrot cake with a little bit of fresh-squeezed orange juice. I know that might sound odd, but you can’t really detect the orange flavor in the finished product, it just rounds out the other flavors nicely. The orange also adds acidity for the baking soda to react with. “Where’s the [pineapple/raisins/walnuts]?”, you might be asking. I don’t really enjoy mix-ins in my carrot cake. For me, cake = tender, and nothing ruins that tender vibe like having to chew on a whole raisin. I much prefer to add ingredients like walnuts in-between layers or as decorations. But, to each his/her own. I will look the other way! Add chocolate chips and I may publicly disavow you, though. Fold in the carrots and bake! The purpose of this method is to bind the gluten molecules in fat before they come in contact with liquid, so that gluten does not form. That, in turn, prevents the cake from being chewy or tough, or baking unevenly. 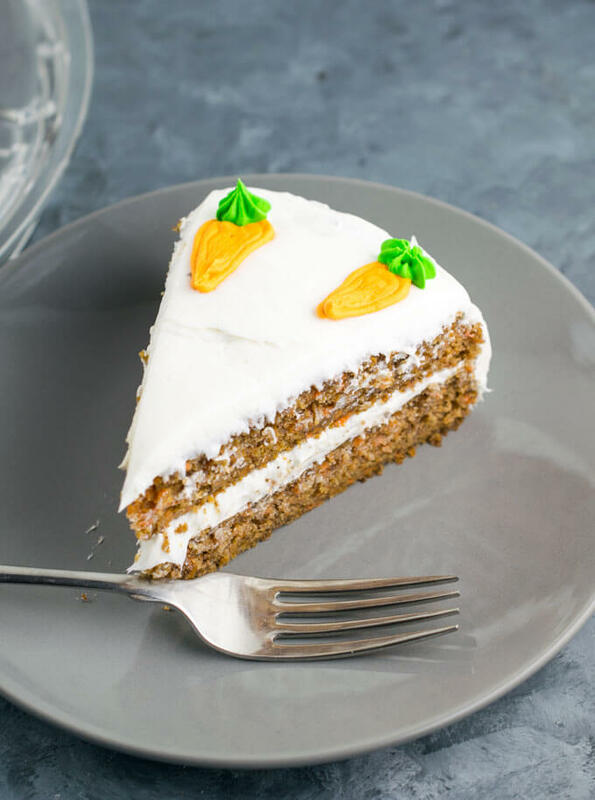 This vegan carrot cake is incredibly tender thanks to this method, which is not often something one can say about carrot cakes! 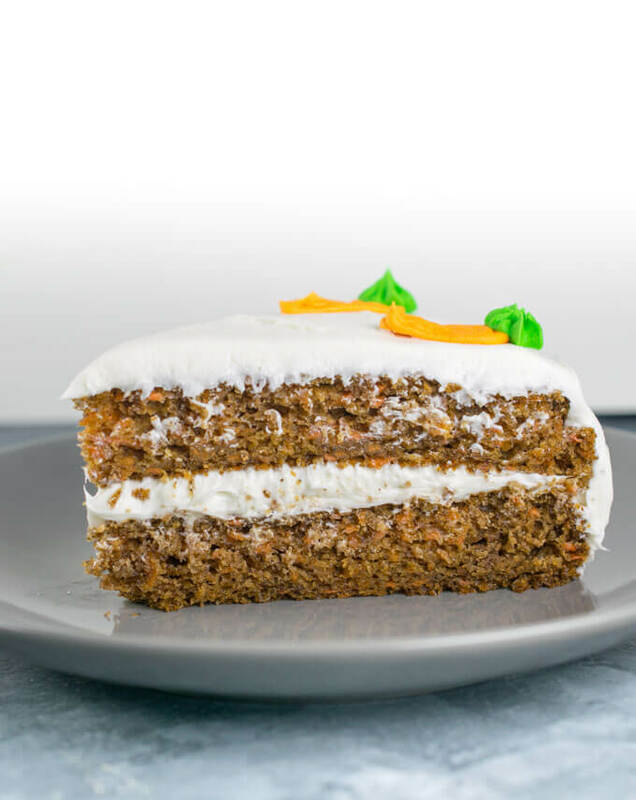 The pictured vegan carrot cake is frosted with store-bought white icing. Many commercial white icings are accidentally-vegan, and I haven’t yet been able to make a homemade version that I like as much. Honest truth. But there is a wonderful homemade frosting that I do highly recommend. More on that in a second. The decorative carrots pictured are made from vegan royal icing (aquafaba based). My lovely and talented recipe development assistant, Eden, made them – I’m no use with fancy things, but there are plenty of recipes online such as this one from Wallflower Kitchen. If there is interest, Eden and I can consider putting together a tutorial soon! I’m not much of a frosting aficionado, often finding myself scraping buttercream off of cupcakes. But if there’s one thing I loved on cakes in my pregan days it was cream cheese icing. Now, my cashew cream cheese makes a wonderful cream cheese icing, but perhaps you don’t want to do a multi-day culturing process just to make a cake. Enter tangy macadamia frosting! I didn’t use my macadamia nut frosting for the photos because I wanted a pure white color for these, but I used it on the version of the cake that I brought to work, which was gobbled right up by the non-vegans in the crowd. Made with macadamia nuts (or cashews), lemon juice, maple syrup, coconut oil, and vanilla, it’s nutty and tangy and a great substitute for that cream cheese-y flavor. The recipe is included below. Be warned, it’s not nearly as sturdy – almost like a cross between a frosting and a glaze – so if you want to frost the sides of the cake, you’ll want to choose something different or add powdered sugar. About a year ago, I prepared a gluten-free version of this for Brent’s birthday (carrot cake is his favorite) and everyone liked it except for me (story of my picky life). I substituted all-purpose gluten-free flour directly by weight. I found it ever so slightly gummy, so if you experiment, maybe try cutting that with a little bit of almond flour to help it crumb more. I’ve baked this cake in a couple of different shapes – namely, rectangular and 9-inch cake rounds. It should be pretty flexible there, just adjust the baking time wisely and check for doneness as needed. 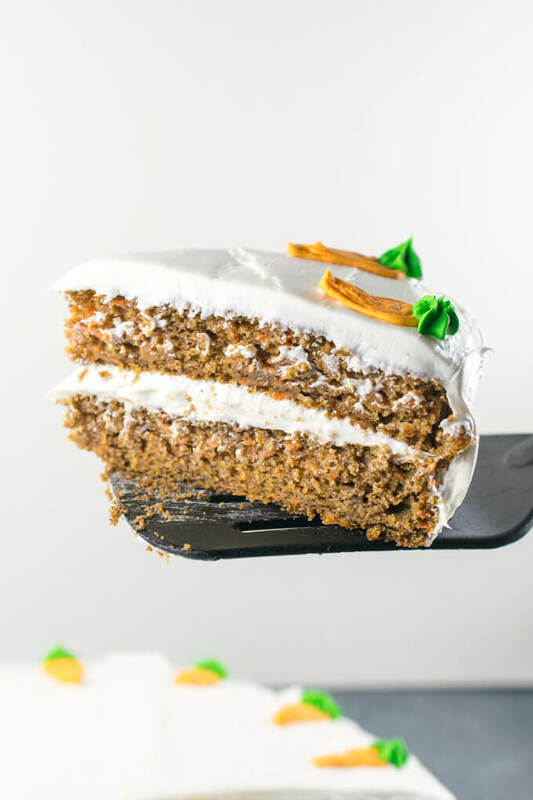 This vegan carrot cake is prone to overbaking if anything, because of the numerous watery ingredients which can evaporate and leave you with a dry vegan carrot cake. Take it out of the oven as soon as it starts to pull away from the sides of the pan. Can this be turned into carrot cake cupcakes? I’m not certain. It doesn’t dome a ton, so you’ll want to fill them pretty full. If anyone tries it, let us know how it goes! As always with my cake recipes, you will need a kitchen scale so that you can measure the ingredients by weight. Never has this been more important than in a recipe that calls for shredded carrots. Carrots come in many shapes and sizes, as do carrot shreds, not to mention the variation in how they can be packed into a measuring cup. Measuring by weight ensures that you use the same amount of carrots that I did. Here is one budget-friendly scale that I recommend. 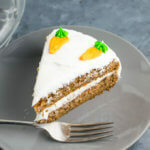 Easy vegan carrot cake made with normal pantry ingredients! You won't know there's no dairy or egg in this delicious cake with "cream cheese" frosting. Preheat the oven to 350 degrees Fahrenheit and lightly grease the bottom of two 9-inch cake pans. (Don't grease the sides; letting the cake cling to the sides helps it rise and stay fluffy). Stir together all of the ingredients for the wet mixture and set aside. Add all of the ingredients for the dry mixture to a mixing bowl, and mix well to combine evenly. If your flour or sugar are extra lumpy, sift them in to ensure they can be evenly mixed. Slowly add the vegetable oil to the dry mixture while mixing. Continue to mix well until the texture becomes like crumbly wet sand. Try to get out as many lumps as you can; this takes some elbow grease with a strong fork. Add one third of the wet mixture to the bowl and mix well until evenly combined. Add another one third of the mixture and mix well again. Finally, add the remaining wet mixture and mix thoroughly until smooth. Lastly, stir in the grated carrot. Divide the vegan carrot cake batter between your two cake pans. Bake for approximately 30 minutes, or until the cake is just pulling away from the sides and toothpick inserted into the center comes out mostly clean. Try to avoid overbaking this cake; it can dry out. Also, avoid opening the oven door at all until the cake has been baking for at least 20 minutes, otherwise that may cause it to sink. Let the cakes cool for a few minutes in the pan, then gently loosen the sides and flip the cakes onto a cooling rack to continue cooling completely. 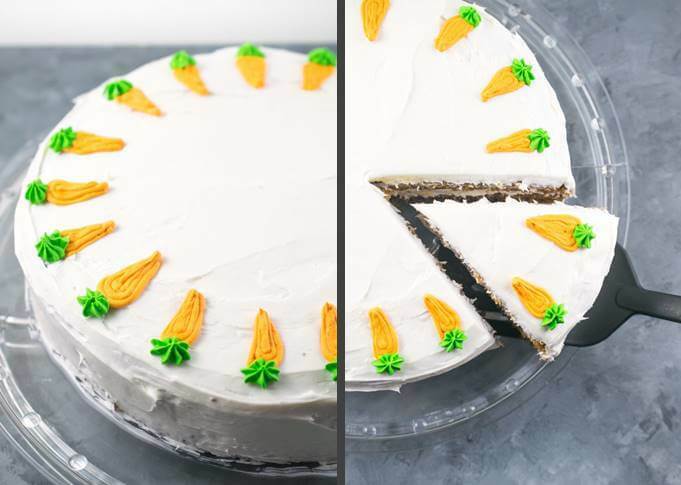 After cooled, you can frost the vegan carrot cake with the frosting or icing of your choice. APPLESAUCE: If using store-bought applesauce, measuring by volume should be just fine, but measure to 125 grams if you're using your own homemade applesauce. SOAKING MACADAMIA NUTS: You can soak the macadamia nuts in room temperature overnight to soften them for use in the frosting; or, soak them in boiling hot water for at least 30 minutes while you make the cake. Cashews can also be substituted for the macadamia nuts, and should also be soaked. Both raw or toasted macadamia nuts work well, but if using cashews, they should be raw. NUTRITION FACTS: Nutrition facts exclude frosting. Adapted from Love & Lemons and my vegan sweet potato cake.